The Conference on the Northern Forests and the Stewardship Act was held in St. Johnsbury, Vermont, June 25th-27th. It asked the question: “Should the Government Control Our Forests?” The Conference was hosted by Associated Industries of Vermont and the American Land Rights Association. Adirondack Solidarity Alliance, Alliance for America, American Land Rights Association, Blue Ribbon Coalition, Common Sense for Maine Forests, Eagle Lumber Co., Inc., Georgia-Pacific Corporation, League of Private Property Voters, Maine Conservation Rights Institute, Maine Property Rights Alliance, Manchester Lumber Inc., Mill River Lumber, Multiple Use Association, New Hampshire Farm Bureau, New York Blue Line Council, Pennsylvania Landowners Association, Property Owners Standing Together (POST), Property Rights Foundation of America, Vermont Farm Bureau, Vermont Forest Products Association, Washington County Alliance. L to R at the head table during lunch on Saturday: Ken Davis, President of POST (Property Owners Standing Together); Roberta Borland of Vermont Forest Products Association; Jim Longley of Maine and candidate for governor spoke in the afternoon about his fight to defeat the Northern Forest Stewardship Act during his ’94-’96 congressional term; Bill Sayre, Forest Policy Task Force Chairman of Associated Industries of Vermont. 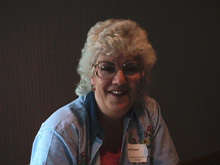 Sandra Dragon, President of Associated Industries of Vermont. The well-run Conference was a reflection of this capable lady and her staff at AIV. Chuck and Cindy Cushman. 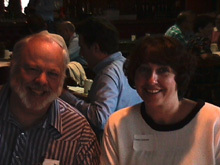 Chuck is Executive Director of the American Land Rights Association and helped organize the Conference. His extensive grassroots experience, lobbying efforts and familiarity with national issues, make him an excellent resource for people anxious to know what the problems are and how they can help. 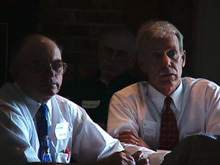 (L) Fred Hardy, a Franklin County Commissioner from Maine and (R) Jon Olson of Maine Farm Bureau. Jon represents his organization’s interests, which include its opposition to the Northern Forest Stewardship Act. During a panel discussion with NH and VT Farm Bureau representatives, Jon gave an overview of the legislative history of the Act.